BTW, “actual reporting” kudos to Tony Castro of the betting sitesLA Daily News,? for catching up with Acevedo, the Padilla ally and patron of East Valley politics, after the Prince did a big town hall meeting at Taft High School in Woodland Hills, last week. The claim that “70% of African-Americans” voted for Prop 8 has been thoroughly debunked. It was inaccurate exit polls. Follow-up research has proven that the number was more around 58 or 59 percent. Still higher than the statewide average, but the anti-black backlash in the immediate aftermath was extremely hurtful … and reporters should not be repeating discredited numbers. As for Alex Padilla, you failed to mention that as Chairman of the Senate Utilities Committee he is completely in the pocket of AT&T. As a liberal Democrat, that does not make me feel better about Newsom’s campaign. And as a San Franciscan, I can tell you what Newsom and Padilla have in common — both are young and incredibly ambitious, to the point they are willing to sell out to whatever corporate interests will buy them off. I’m not surprised they’ve decided to join forces. Although there is no dispositive evidence, Paul is correct that some post-election studies suggest the network exit poll may have overstated the proportion of blacks voting for Proposition 8 and that it may have been closer to 58% (or six in 10 rather than seven in 10). 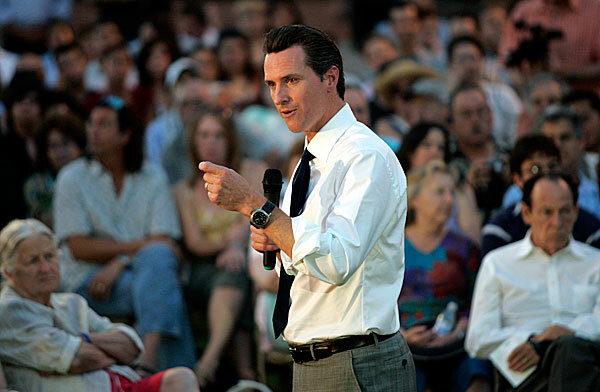 The word “generic” seems to fit Newsom and his gubernatorial campaign perfectly. He was more impressive as a new mayor in 2004 (before the list of what he hasn’t done grew tellingly long).